Column Designs offers faux roman column display fixtures that will help you make the most of your retail store or tradeshow booth. We offer our display fixture line in many sizes starting from 24 inches tall all the way to 11 feet! All of our display fixtures are lightweight and easily portable so you can rearrange your storefront at anytime or move from tradeshow to tradeshow. At Columns Designs, we are your one-stop shop for the display fixtures you need to properly show your products. Our faux roman display fixture line will show the customer what a quality product you have and build their trust in your company. Since our display fixtures are light weight, they can be easily installed in any storefront and moved around at any time with ease. Also, if you participate in trade shows, they can be moved from your store to your tradeshow booth with ease and will maintain durability. All of our display fixtures are made to order ranging in sizes from 24 inches all the way to 11 feet. Check out our line of display columns and display props too. We are certain you will find exactly what you need in our line of Wedding Columns, Decorative Columns, Plastic Columns, Display Columns! 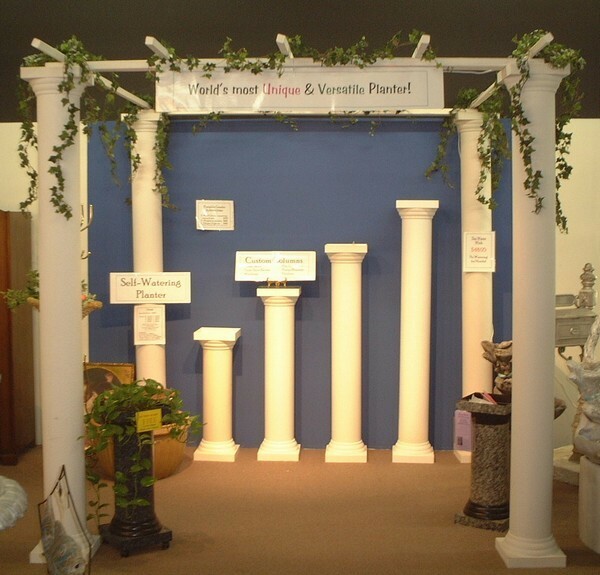 Decorative Columns give your store, booth, or event an air of elegance and beauty--sure to please!